There is a temple of Lord Hanuman near the main entrance of the fort which is hidden between two bastions. There are porches in the doorway. The small size of the fort is understood once we enter the fort premises. On the inside portion of the doorway there is a Lotus flower carved in stone. Just opposite there a raised platform behind which there is a doorway to the sea side. There are remnants of houses to the right and a Tulsi Vrindavan structure of a tomb to the left. We can circumnavigate the fort on the platform of the fortified wall which is to the right of the entrance way of the fort. Eventually we come to sea facing side of the fort and where the wall is somewhat in ruined shape and has a sea side doorway which is still intact. The whole fort takes about 15 minutes to circumnavigate. 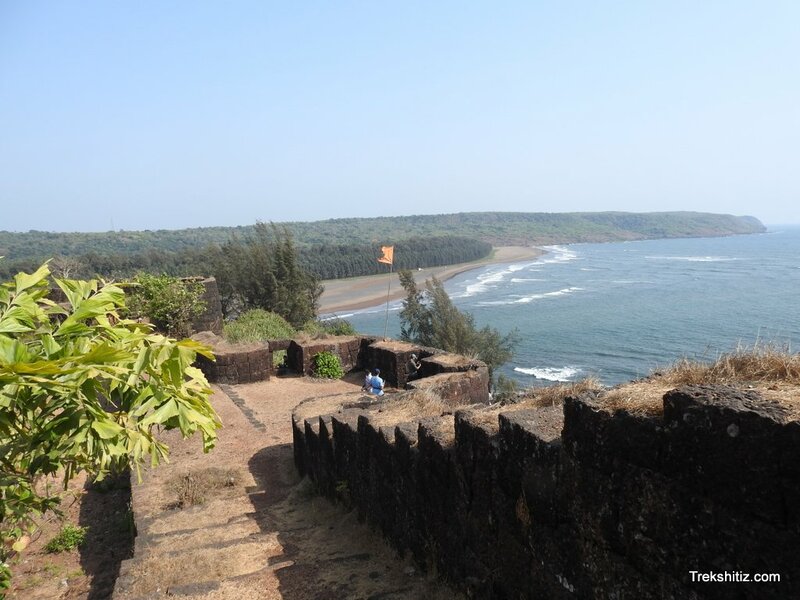 Purnagad fort is 25 kms from Ratnagiri which is easily accessible by a bus or a pricate vehicle from Ratnagiri. It takes 10 minutes from the base to reach the fort top by taking the steps.